The name whiplash, says it all. This injury occurs when the head and neck are whipped from back to front, or broad sided from left to right or visa versa. The majority of car accidents are rear-end collisions, with whiplash being a common result. 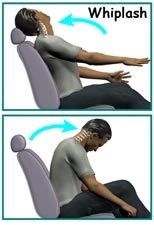 Whiplash can also occur from other kinds of trauma, accidents, and falls. Because the majority of whiplash incidents impact the spine and the surrounding nerves and tissues, chiropractic care is an excellent avenue for treatment. Chiropractic doctors are skilled in assessing the source of the pain associated with a whiplash injury and determining a plan for effective treatment. Chiropractic treatments are gentle and non-invasive. Through small adjustments, people find great relief from the pain associated with whiplash, and are set on a road to full recovery. Call our office at Total Health Clinic to discover how chiropractic care can help you recover from whiplash.